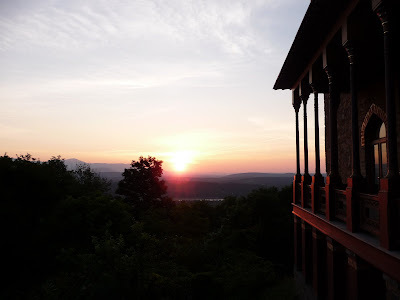 The weekend of September 24 and 25 offers two unique opportunities to enjoy the landscape at Olana State Historic Site. On Saturday, September 24, author and geologist Bob Titus will lead a Hudson Valley Ramble Walk at Olana starting at 2 p.m. On Sunday, September 25, Lin Fagan will lead a walk starting at 9 a.m. Both groups will meet at the Olana Visitor Center at the top of the hill and continue their respective walks from that location. The tour on Saturday has a $5 vehicle fee per car as the cost of admission- the tour on Sunday is free of charge. Professor Robert Titus has held several very popular Hudson Valley Ramble Walks at Olana. 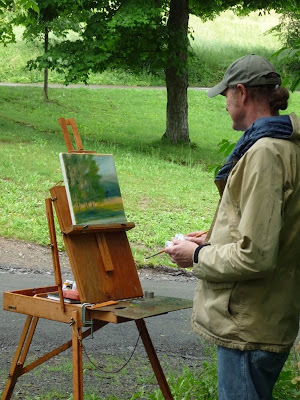 This year his walk entitled “Unplanned Views” will circle Olana looking at the dramatic views that artist Frederic Church took advantage of as he laid out his landscape. 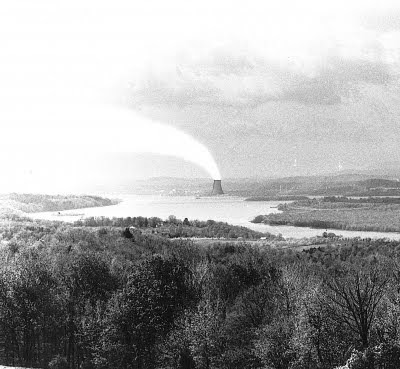 Titus will point out the views and then describe their geologic histories with a series of dramatic readings describing moments of time in the geological past that brought these views into being for Mr. Church. Reservations are required for this walk and it is limited to 20 persons- plan for two hours in the landscape with easy to moderate walking. Please wear clothing and shoes suitable for walking outside on shale paths and woodland areas. For both walks, bring cameras, binoculars, sketch pads, water, and a pure joy for the landscape of the Hudson Valley. Reservations are required for both tours- please call 518-828-0135 between 9 AM and 5 PM Tuesday – Sunday to reserve a spot on one or both of these walks in the landscape. Wagon House Education Center programming is made possible in part through support provided by public funds from the New York State Council on the Arts, a State agency- the Hudson River Bank & Trust Foundation- the Educational Foundation of America- the John Wilmerding Education Initiative, and the members of The Olana Partnership. 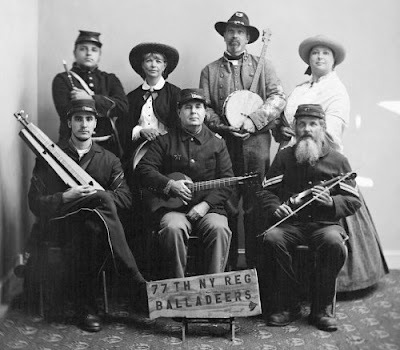 The 77th New York Regimental Balladeers will present a free concert of music popular during the Civil War along with letters and commentary from and about the war. The music starts at 2 PM on the East Lawn at Olana State Historic Site on Saturday, August 13, 2011. There is a $5 per car fee at the entrance to the park- bring your own blankets and chairs- the concert is from 2 – 4 PM. 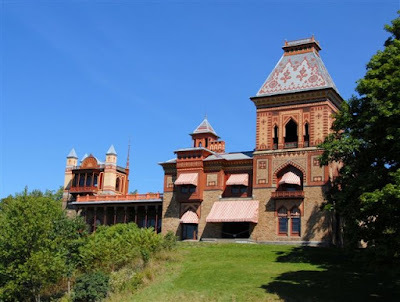 The Civil War is of importance to Olana because of its relevance to Frederic Church, his art, and his family. While Church did not fight in the Civil War, he supported it financially- some of his greatest works, like Icebergs and Cotopaxi, were produced during this time. He and his family, like so many in this country, suffered the deaths of dear friends in the conflict. Long time friend and author Theodore Winthrop was lost in one of the first battles of the war- later friend and fellow Connecticut artist John Jameson died at the infamous Andersonville prison camp. Currently, an exhibit, Rally ‘round the Flag: Frederic Edwin Church and the Civil War, is featured in the Evelyn and Maurice Sharp Gallery. The exhibit explores the Civil War connection to the artist and the country- it also provides a look at the paintings and a career cut short by the conflict, the works of Church’s young friend and artist, John Jamison. 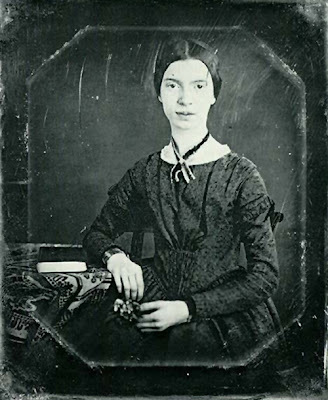 The Olana Partnership will present “To See a Summer Sky,” a one-woman theatrical performance based on the life of Emily Dickinson. Excerpted from William Luce’s play “The Belle of Amherst,” on Saturday, July 2 from 3:00-4:30 p.m. The performance will take place at Cosy Cottage, the first home of Hudson River School painter Frederic E. Church located in the historic farm complex at Olana State Historic Site. Triple Shadow creates visual theater challenging artistic boundaries, revealing the interconnectedness between human cultures and nature. The collaborative process is intercultural and interdisciplinary, affecting audiences in sensory and subconscious ways creating new perceptions of time and memory. Mari Andrejco trained with Sanford Meiser at the Neighborhood Playhouse in New York City. She has performed in Europe, Mexico, Egypt, and the United States. Andrejco has done stage acting, television, and video including appearing as Queen Elizabeth I and Susan B. Anthony for PBS. She has worked with Shakespeare and Company, Triple Shadow, and the Pleiades Company and has taught at the Institute for Arts in Education in the Albany schools. Beth Skinner has premiered ten productions at La Mama E.T.C. in New York City with support from the theater programs of National Endowment for the Arts, New York State Council on the Arts and Massachusetts Cultural Council as well as grants from NEA Opera and NEA Presenting Program. The company has toured in Egypt, Italy, Hungary, Romania, Canada, and Indonesia and collaborated with artists from Japan, China, Korea, Hungary, Romania, Indonesia, Mexico, and Russia. The performance will take place at Olana State Historic Site 5720 State Route 9G, Hudson, NY. Cost of the play is $5.00 per person for non-members and free for members of The Olana Partnership. A $5.00 entry fee per vehicle will be charged (fee is waived for members of The Olana Partnership). This fee may be credited toward a house tour as long as house tour tickets are available. Please bring blankets and lawn chairs for seating. For more information contact Sarah Hasbrook, Education Coordinator for The Olana Partnership, at shasbrook@olana.org or call (518) 828-1872 x 109. This program is made possible in part through support provided by public funds from the New York State Council on the Arts, a State agency- the Hudson River Bank & Trust Foundation- the Educational Foundation of America- the John Wilmerding Educational Initiative, and the members of The Olana Partnership.